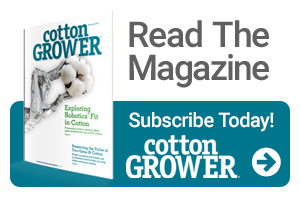 May 11 is the deadline for producers to sign up for USDA’s Cotton Ginning Cost Share (CGCS) program, which is expected to provide approximately $220 million in economic support to eligible producers. Payment rates will vary by region, and payments will be calculated based on 2016 cotton acres reported to the Farm Service Agency (FSA). An online CGCS Fact Sheet provides a program overview and identifies the payment regions and rates. Payment eligibility rules and payment limits for the 2016 crop CGCS program are the same that were in place for the previous 2015 CGCS program. The payment limit is $40,000 per person or legal entity and is separate from the $125,000 limit for other commodity programs. Producers should have received their prefilled applications by mail – but also have the option of visiting their local FSA office and have them pull the CGCS application for completion. Every effort will be made to process approved CGCS applications for payment as soon as practicable and, if possible the same day as approval. Producers who did not receive a CGCS payment by April 15, 2018, will receive a reminder post card from USDA.